When Apple released the beta version of Safari 4 I thought, "whatever". While I like Safari and find it to be a perfectly capable browser I am hopelessly addicted to Firefox with its extensions and add-ons. Then I started to see some of the articles coming out about the new Safari and two things got me interested: speed improvements and a new UI for tab management. I pulled down the Safari beta and installed it on my MacBook Pro, which has 4GB of RAM and is running the latest version of Leopard. By default it installed over my existing version of Safari which I wasn’t too happy about. You can uninstall it and it will roll back to your previous version if you need it to but I would have liked to be able to run both concurrently. I’m sure there’s a strong technical reason that’s not an option. Quite a few users complained about problems with Mail.app, especially if they used Growl for notification support. In my limited time looking at it I didn’t experience any problems with Mail. Your mileage may vary. Typical of something from a Finder or iTunes Cover Flow view you can have nicely rendered mini web pages on a large black background that give you a menu of sorts for your most used web pages. While you can "pin" web pages into the view, move and remove those that you don’t like, the current beta doesn’t give you the ability to put a site in that you want. You have to hope it comes up for it to appear in the list and then pin it. Hopefully this is just a function of it being beta software. I was furiously removing sites and hoping Safari would give me one of my more recently visited sites but after a while it stopped offering suggestions (hence the gap where two web pages are missing in the image above). There are small, medium and large views that hold 24, 12 and 6 web pages respectively. By default this is your home page so it will come up quite a bit, though you can of course set your home page to anything you like. There’s also a little button on the left of the toolbar that gives you quick access to it. If Apple puts in the ability to manually add my own pages this will be a very nice feature. 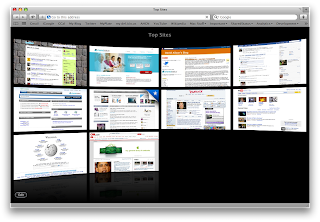 It would be even cooler if I could create groups of these "top sites". My initial reaction to the new tabs was that they were really cool. By moving the tabs into the caption bar Apple has effectively regained roughly 20+ pixels of browser real estate. All the caption bar was good for in the past was as a drag surface and title area anyway. This does create a bit of a challenge though: how do you move the window? Actually, the same way you did before. Simply single click on any of the tabs—even an inactive one—and you can drag the entire Safari window. As you move the mouse into a tabs area you will notice the close button appears as well as a small textured area to the right of the tab. That textured area allows you to drag the tab out of the browser window and open a new window with that tab as the content area. Dan Frakes at Macworld has a really good article about Safari’s new tabs: Good or bad? He covers this topic in a lot more detail than I do. I would love to see Apple add an option that would allow me to turn off the close button for non-selected tabs. That would mean less of a chance of hitting the mole, er, close box on accident. With screen real estate always such a premium I do like the way Apple is tackling this though; it just needs a little tuning. Since this is going to set the standard for OS X tab metaphors moving into the future I’m sure Apple appreciates the gravity of these kinds of decisions. The Webkit folks did some major tuning on Safari beta 4; the speed is simply stunning. How much faster is it? If I load my primary blog page (www.davidalison.com), which generally has my last 7 blog posts on it with some fairly complex tables, DIVs, images and poorly designed HTML it takes nearly 4 seconds to completely render in Firefox. Safari 3.2 would complete the render in roughly 3 seconds. The beta handles it in roughly 2 seconds. Web pages are noticeably snappier and pages that have some of the more complex DIVs for representing things like charts fly up on the page. There is one add-on I use in both Firefox and Safari religiously and that’s 1Password. Unfortunately it needed to be updated once the beta was released; fortunately the Agile Web Solutions folks knocked out an update within days that fixed it. There are other plugins that have needed to be updated as well but most of the popular ones appear to have been patched already. Macworld recently put together an article on some of the hidden preferences for Safari. There are a couple of items in there that can help you customize Safari a little more. All in all I’m pretty pleased with this new version of Safari, especially when taking into account that it’s a beta release. I don’t know if I’ll switch from Firefox being my default browser, though if Apple can tweak some of the UI issues and still maintain that incredible speed advantage I may just reconsider that. What’s your take? Do you like the new Safari?